Since 2015, the Sto Foundation and the non profit ARCH+ Verein e.V. have supported the practical training of up-and-coming architects in the area of architecture communication. The scholarship programme is based on the conviction that the ability for critical reflection as well as conveying the social importance of architecture and cities are essential for relevant, practical designs. This very successful partnership will continue this year. 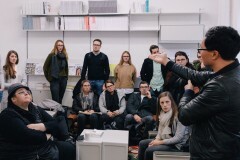 The 2018 scholarship recipients will conduct research on fundamental issues such as the land questions (in cooperation with professor Arno Brandlhuber/station+ at ETH Zürich), the impact of digitisation on the "Datatopia" of architecture (in cooperation with professor Georg Vrachliotis at KIT Karlsruhe), the workshop of the "projekt bauhaus" (which is being supported by the German Federal Cultural Foundation, the Schering Foundation and the Federal Agency for Political Education), the publication and exhibition project "An Atlas of Commoning: Places of Working Together" (in cooperation with the ifa Institute for International Relations) and the importance of standardisation for architectural practice (in cooperation with professor Philipp Oswalt at the University of Kassel). The ARCH+ association was founded in 2014 by well-known ex-perts to promote socially relevant discussions related to architecture and cities. Since 1968, ARCH+ Magazine for Architecture and Urbanism has been one of those essential publications that not only covers the world of architecture but also helps shape it with the topic it reports on.